Really like the lift. After years of washing the bike on the ground, I'm finally able to do a good inspection. I found very small pits in the wheels. I contacted the manufacturer of the wheels before the warranty expired to have them replated. The lift has already paid for itself. Chad, love my new lift! Very sturdy and a perfect fit for my application. 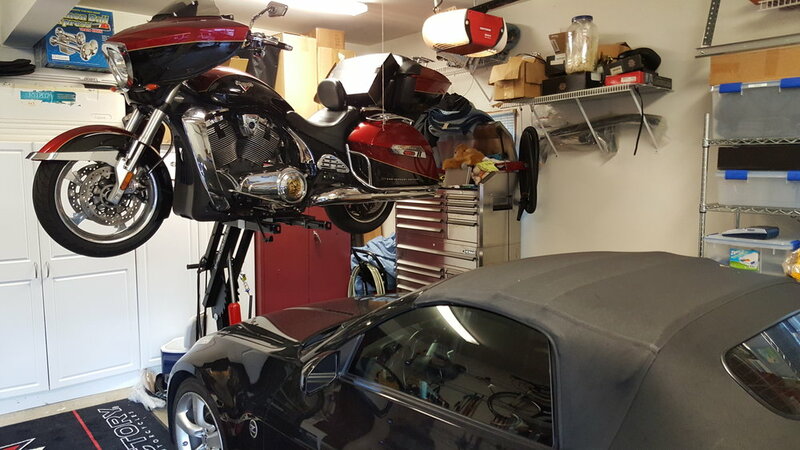 Really frees up space in my crowded garage. Thanks again, Bernie Schaknowski. Hey guys finally getting around to emailing a couple pics of the lift in use to easily change a rear tire before my wife's bike heads out for the summer. Last winter my bike was up on the lift for a couple months when I stripped it down to get sheet metal painted. The lift stays in the garage in the summer for oil changes and easily moves into the basement in the winter for winter projects on the bikes. I also use it for lifting all sorts of items into my truck bed like my fifth wheel hitch, even 200lb trees that I planted last year. I've never regretted for a moment buying the best, most flexible bike lift made! Here are the pix of my Victory Cross Country motorcycle on your lift. The caveat is that we added the steel Witchdoctor's Skid/Jacking plate to provide stability, due to Victory motorcycles using the engine as par of the frame and having a beveled bottom instead of two frame rails like a Harley. I've included the pix of my Cross Country on your lift. Thanks again Chad for making a great product.